A camera capable of creating images with "unprecedented detail" has been unveiled by US engineers. 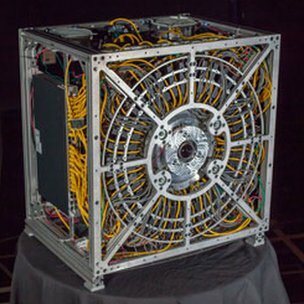 The prototype machine - dubbed AWARE2 - is capable of of taking pictures with resolutions of up 50 gigapixels, equivalent to 50,000 megapixels, according to the team from Duke University in North Carolina. It works by synchronizing 98 tiny cameras in a single device. The camera was developed by a team led by engineer David Brady and Michael J. Fitzpatrick, professor of Electric Engineering at Duke's Pratt School of Engineering, along with scientists from the University of Arizona, and the University of California. They received funding from Darpa - the United States Defense Advanced Research Projects Agency. "Each one of the microcameras captures information from a specific area of the field of view," Mr Brady said. "A computer processor essentially stitches all this information into a single highly detailed image. In many instances, the camera can capture images of things that photographers cannot see themselves but can then detect when the image is viewed later." Pixels are basically individual "dots" of data - and the higher the number of pixels, the better resolution of the image. The researchers believe that within five years, as the electronic components of the cameras become miniaturised and more efficient, the next generation of gigapixel cameras should be available to the general public. "The camera is so large now because of the electronic control boards and the need to add components to keep it from overheating," Mr Brady said. "As more efficient and compact electronics are developed, the age of hand-held gigapixel photography should follow."